After confirming his White House departure, Bannon told The Weekly Standard on Friday, "The Trump presidency that we fought for, and won, is over," noting that now that he is gone, it will be "that much harder" for Trump to achieve wins, like the border wall. "We still have a huge movement, and we will make something of this Trump presidency. But that presidency is over. It'll be something else. And there'll be all kinds of fights, and there'll be good days and bad days, but that presidency is over." Bannon predicts that moves coming from the White House are about to get much more "conventional" due to what he predicts will be a flood of moderates on the Hill. "They're not populists, they're not nationalists, they had no interest in his program." 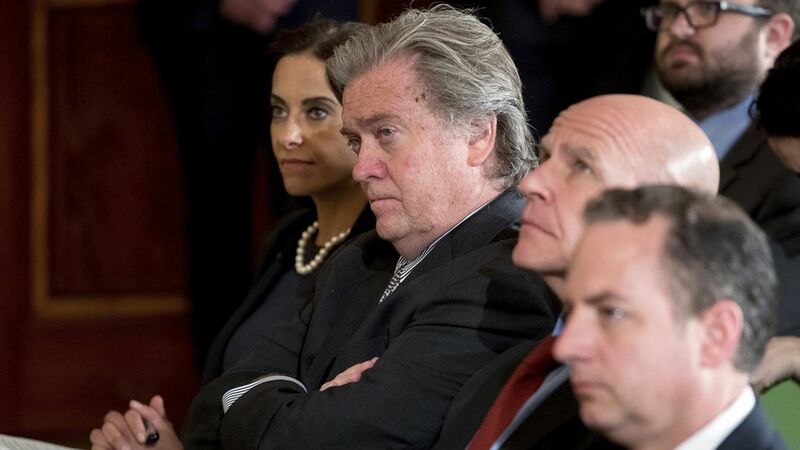 Be smart: Axios' Jonathan Swan says Bannon's comments will enrage Trump, who already thinks Bannon took too much credit for his victory and the movement that propelled it. Zinger: "I'd always planned on spending one year...I want to get back to Breitbart." Bannon's thoughts on Trump's true nature: "I think you saw it this week on Charlottesville – his actual default position is the position of his base"
Closing quote: "I feel jacked up...Now I'm free. I've got my hands back on my weapons. Someone said, 'it's Bannon the Barbarian.' I am definitely going to crush the opposition. There's no doubt. I built a f***ing machine at Breitbart. And now I'm about to go back, knowing what I know, and we're about to rev that machine up. And rev it up we will do."